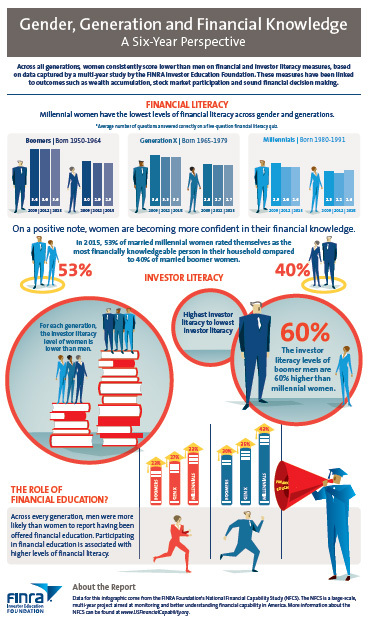 WASHINGTON — Women consistently lag behind men on financial and investor literacy scores across generations of boomers, gen Xers and millennials, according to a multi-year study by the FINRA Investor Education Foundation. In 2015, the gap in financial literacy between boomer men and women was 19 percent, and for gen Xers 18 percent. But for millennials, it was only 10 percent. Financial literacy – having the knowledge to make informed financial decisions – has been linked to wealth accumulation, stock market participation and retirement planning. Investor literacy involves knowledge of investment concepts. The data were collected as part of the FINRA Foundation’s National Financial Capability Study, which surveyed more than 80,000 American adults in 2009, 2012 and 2015 on four key components of financial capability, including financial knowledge and decision making. The study also included a detailed analysis of 2,000 respondents surveyed in 2015 who hold investments in non-retirement accounts. Researchers analyzed gender data across three generations of respondents – millennials1, born between 1980 and 1991; gen Xers, born between 1965 and 1979; and boomers, born between 1950 and 1964. While older generations reported less exposure to financial education, the study shows that across every generation, men were more likely than women to report having been offered such education. Millennials accounted for the highest exposure to financial education: 45 percent of millennial men and 33 percent of millennial women said they were offered such education. However, the disparity in access to financial education continues to be significant. Investor literacy levels of boomer men are 60 percent higher than those of millennial women. Women may answer “Don’t know” more often when surveyed. This could result from women being more open to assistance or less confident than men, or it could reflect men being overconfident in their self reporting. After removing respondents who answer “Don’t know” from the analysis, the gender gap in financial literacy narrows for boomers and gen Xers and nearly disappears for millennials. The percentage of married women who report that they are the most financially knowledgeable person in the household has increased since 2009, and it is highest for millennial women — 53 percent for married millennial women in 2015 compared to 48 percent for married gen X women and 40 percent for married boomer women. The survey’s full data set, methodology and related questionnaire are available at USFinancialCapability.org, along with an infographic that illustrates the study’s results. The FINRA Foundation supports innovative research and educational projects that give underserved Americans the knowledge, skills and tools to make sound financial decisions throughout life. For more information about FINRA Foundation initiatives, visit finrafoundation.org. 1 While there are no formal cutoffs for generations, 1991 was used as the cutoff for millennials because the youngest respondents for the first wave of the NFCS (i.e., the 2009 wave) were 18 in 2009 – that is, they were born in 1991. To keep the definition for the generations consistent across the waves of our study, 1991 was used as the cutoff for the 2012 and 2015 waves. This results in a cutoff for millennials that appears lower than most cutoffs, which are typically around 1996.